Not so long ago, a typing machine was top technology. Not so long ago there were less communications, yet more time. Not so long ago life was less technified, yet more natural. Not so long ago. Have we evolved as much as technology? No hace tanto, una máquina de escribir era alta tecnología. No hace tanto había menos comunicaciones, pero más tiempo. No hace tanto, la vida era menos tecnificada, pero a la vez más natural. No hace tanto. ¿Hemos evolucionado tanto como la tecnología? PIENSO QUE VIVIMOS EN UN MUNDO CAMBIANTE. NO CREO EN LA EVOLUVION DEL SER HUMANO, SIMPLEMENTE CREO QUE ASI COMO LA TECNOLOGIA VA AVANZANDO NOSOTROS NOS VAMOS ADAPTANDO, NO EVOLUCIONANDO CON ELLA. Amazing shot! This shot is my all time favorite on Flickr! 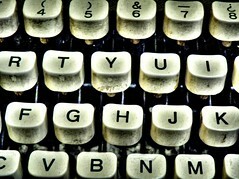 It conveys show much to me just seeing those old worn typewriter keys. So much has changed in our world. I miss those old days. Your picture is very moving! Perfectly clear and amazing lighting. Love it!! !